As one door closes, two others are wide open! It’s always hard to say good-bye….which is why we are choosing to say hello instead! Our Granville Street location in the United Kingdom Building first opened its doors in 2003. We call it our flagship store and it has served us well over the years. It has also endured many changes – new products, new look + new faces. But one thing has never changed – our loyal customers who have been with us through thick and thin! So rather than lose touch, we want you all to know where to find us. Our new location is located at 609 Granville Street @ Dunsmuir. It’s just a hop, skip + jump away. It is bigger + brighter with even more seating for our new friends + old! On July 21st, join us for a free fun-filled event as we say goodbye to our flagship location + say hello to its new location. We will celebrate our move with free coffee, tea + treats from 11:00am – 1:00pm at our original location: 429 Granville Street. After July 21st, continue visiting with your favourite baristas + enjoying your favourite Take Five items – just a 3 minute walk away. Or visit us at 999 West Hastings (Axa Place) where delicious food + drinks are waiting too! After all, all goods things don’t have to come to an end! 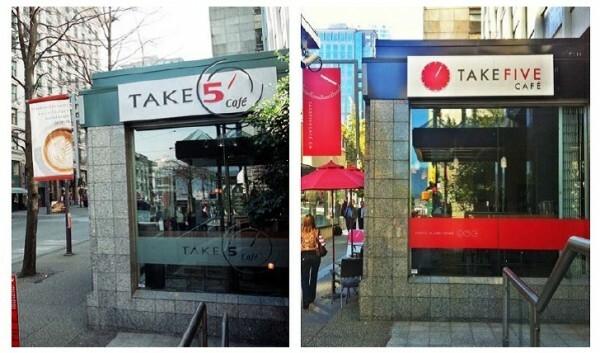 Check out other Take Five Cafes in your area.